Since January, HMRC have been issuing the new PAYE tax codes for the new tax year 2014 – 2015. This tax year will start from 6th April 2014. Oddly enough, although taken directly from the HMRC website, what they don’t say is what the basic rate tax code will be. As the personal allowance for this coming tax year is £10000 (that is the amount you can earn before having to pay tax), the tax code will be 1000L. It is really important that tax payers keep an eye on the tax code they are given. If it is not 1000L and you’re not sure why it’s different, call your tax agent for clarification. 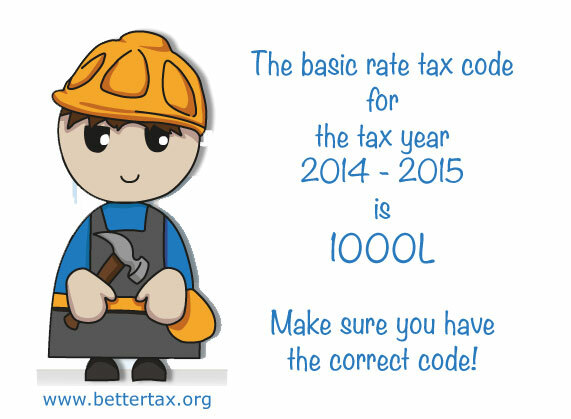 At Bettertax part of our service is to sort out incorrect tax codes for our clients. However, even though we are the registered tax agent, HMRC don’t tell us of tax code changes. We do remind clients to let us know of any changes. We wrote an article nearly 3 years ago, Have They Changed Your Tax Code which is as relevant today as it was then. If you are at all confused or worried about your tax situation, get in touch. We are expert self-assessment tax returns agents, award winning and independently ranked No: 1 in the UK.